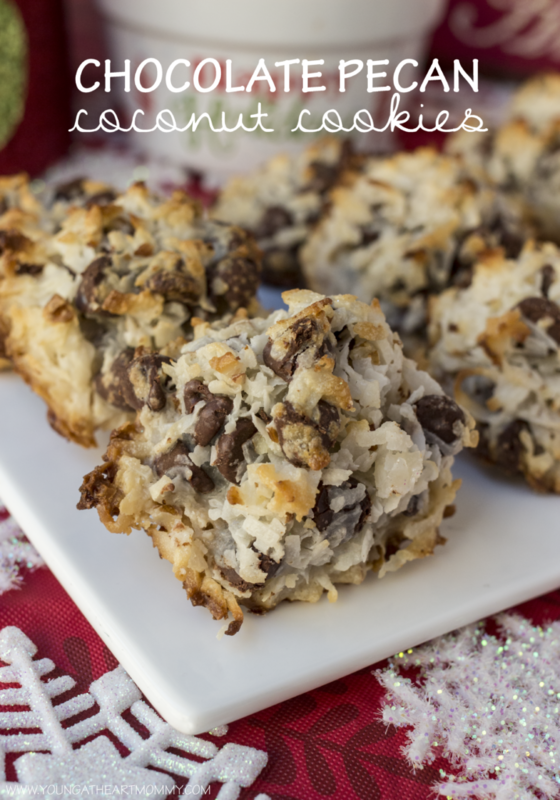 These Santa-worthy Chocolate Pecan Coconut Cookies are not only incredibly delicious, they’re also made with only four ingredients. With this recipe, you’ll be the MVB (most valuable baker) of your cookie exchange or holiday party! 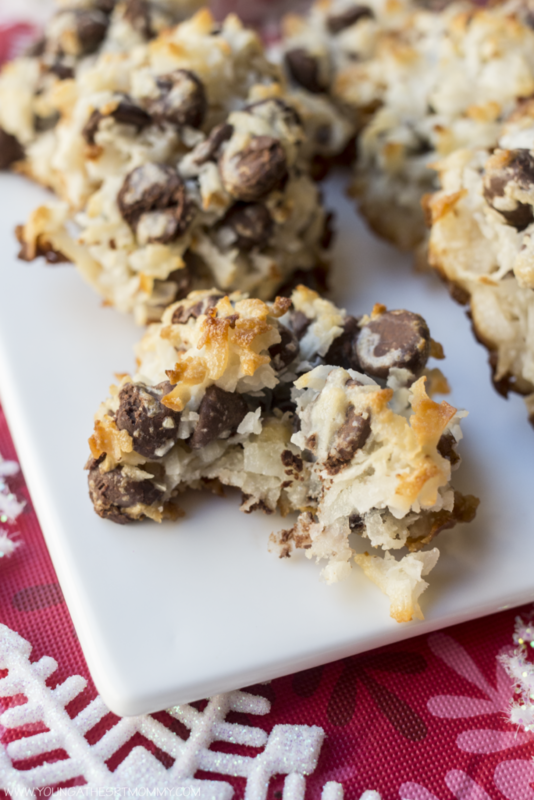 On the first day of Christmas, Santa gave to me – Chocolate Pecan Coconut Cookies! As we countdown the days until the arrival of my all-time favorite holiday, I’ve been busy baking up a storm of sweetness. My mom and I combined forces this weekend in preparation for her annual Cookie Exchange with friends. Each year they get together for a competitive cookie showdown that consists of baking, taste testing, and judging of various categories. The recipe she chose is fool proof and only requires four ingredients. It never lets us down which is why I’ll be re-creating it for the Ugly Sweater party I’m hosting next Sunday. 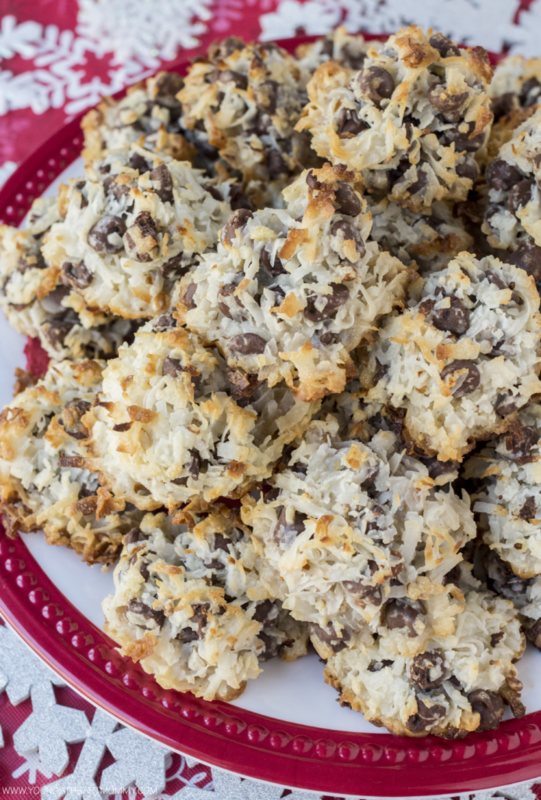 The combination of toasted coconut, chocolate chips, and chopped pecans – all coated in sweetened condensed milk – is what dessert table dreams are made of. These cookies may take less than 20 minutes to make and bake, but you would never know it based on how they taste. Each bite is moist, chewy, and filled with milk chocolate chips. They remind me of my favorite chocolate dipped coconut macaroons from Godiva! If that doesn’t temp you, they also stay fresh and moist for several days after they’re made. 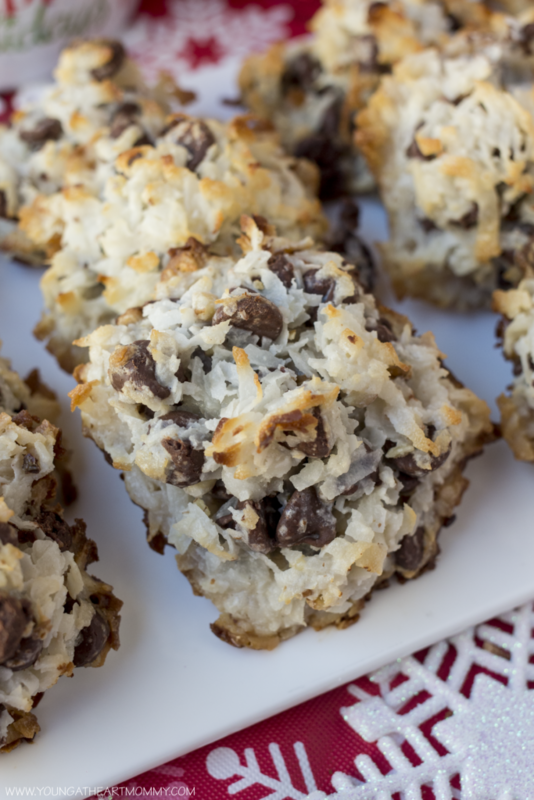 In a large bowl combine coconut flakes, chocolate chips, and pecans. Add in condensed milk and mix together until they are coated evenly. Use an ice cream scooper or spoon to scoop out dough and shape into discs. Pat the tops down flat. Rinse hands frequently to keep them from getting sticky or have a small bowl of water nearby to dampen your fingers in between. Bake cookies for 10-12 minutes or until the tips of coconut are just starting to turn golden brown. Allow to cool on baking sheet and serve. What kind of cookies do you enjoying making during the holidays? Please deliver some of these STAT! Lol They look so yummy!! About how many cookies does this recipe make? We had pecan trees in our yard growing up, so we always had pecans on hand, and they were free. These look amazing! I'll have to try! Thank you! These look so delicious. I love coconut macaroons. I would love to make these. 😍 looks so yummy and seems so easy! Definitely trying these after I get my lil one to nap. Thanks! !